Comical and lively, yet also way too complicated and longer than it should have been. The best of the movies about the 2008 financial crisis (as opposed to films like Too Big To Fail and Margin Call,) this one has something that those other movies don’t. Humor. That and a desire to explain what is actually happening to the audience. It uses some clever tricks to do this, but it’s still not quite enough. This is some very complicated subject matter, and the movie brings in too many characters and too many plot strangs to easily manage. It is also way too long of a film. Especially when some of the storylines are so similar to each other. The movie deserves a lot of credit for doing the best job of telling this story, which is an incredibly tough story to tell, without the audience getting lost or no being entertained. With this one, we have the closest attempt at actually getting it right. The Big Short is another financial crisis movie about the 2008 stock market crash that changed the economy of not only America, but also the rest of the world. For how much of a big deal Hollywood makes of this situation these days, you would think it was on the same level as the Great Depression of the 1930s, which ended up having such strong ripple effects that it led to Germany’s own depression and then World War II. The 2008 financial crisis wasn’t nearly as interesting, and yet we have had quite a number of movies about it. 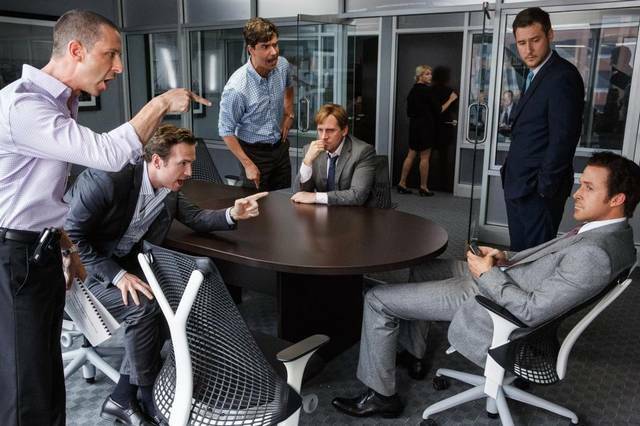 There was Too Big To Fail, then there was Margin Call, and now we have The Big Short, which is by far the best of the bunch. That is in no small part due to the director, Adam McKay. This guy has always been a comedy director, and his credits include Step Brothers, Anchorman, Taladega Nights, and The Other Guys. Notice a pattern? Not only are they all comedies, but they all feature Will Ferell. The Big Short does not. Instead, McKay brings in Steve Carrell, from the Anchor Man films, to help him out with being comforable, while taking on the challenge of this film. You see, this is McKay’s voray into serious movies, and it’s a tough nut to crack. Especially doing a film about the financial crisis. But McKay brings his comedic edge to the table, and that goes a long way with this type of film. You see the movie is about some very complicated content. And what McKay realizes, that the directors of those other movies didn’t, is that this type of material and storyline is too complex for the layman to just watch and understand. It needs to be explained to us. We need pauses and characters stopping the movie to give us example and analogies for how things in this industry actually work. And that’s exactly what we get. It starts with Ryan Gosling doing voice over narration and breaking the fourth wall to speak directly to the viewer, while he freezes the image behind him. But that’s only the beginning. Soon we have all kinds of celebrities popping up to each just explain one part of what’s happening. There’s Margot Robbie in a tub, Selena Gomez at a roulette table, and best of all, Chef Anthony Bourdain in a kitchen, using fish that didn’t sell one day as an example of what the banks did with bad mortgages they had sold. Instead of throwing them (or the fish) in the garbage, the banks would just toss them into a pile with other, good mortages and then ship that pile off and sell it. They were hiding the bad ones, hoping nobody would notice. And it’s McKay’s use of celebrity cameos and freeze frame that help the viewer make sense of all this. The main reason why this is better than the other movies about the topic, is because it is the one that is easiest to follow. Now, that being said, it is still incredibly complicated. For one, everything that happens in this movie is dialogue. There is no action of any kind. It’s either talking or yelling, and most of it is characters trying to convince others of something. The way it all gets started is that Michael Burry, (Christian Bale,) is a lose cannon investor, and he pretty much has carte blanche at his company, where if he wants to make a financial move, they will back him and give him the money to do it, no questions asked. Only this time, with what he wants to do, the company just can’t sit back and watch. They have to ask questions and express their doubt. You see, Burry wants to short the housing market. That means he wants to bet against it. He wants to bet that the hosuing market is going to go down. And he wants to bet big on it. Of course everyone thinks he is crazy. After all, the one thing that has always been true in life (other than that you die,) is that real estate goes up in value. Buy land, they say, because God aint making any more of it. Only Burry sees something that makes him take the opposite approach. He sees that a whole ton of bad mortgages are being bundled together and sold off, that the people paying the mortgages have a fixed rate that they must pay each year, of something they actually can manage, and that all of this ends in the year 2007. Then, once that year hits, their fixed rate goes away, and these people will suddenly have to start paying what the houses are actually worth, which is something that none of these people can actually afford. Now, how in the world Burry was the only one to notice this, I have no idea. How did people not realize that they were agreeing to pay their fixed rate only for a set amount of time, and that after this time was over, they wouldn’t be able to afford it anymore? Maybe they just didn’t care. And neither did the banks, apparently. Burry now sets up a meeting with a bank who he wants to get to finance his investment. The bank agrees, only Burry wants more than that. He realizes that if what he thinks is going to happen actually does happen, than giant companies like this bank will very likely declare bankruptcy, which means he won’t get paid. Burry has a plan. He offers to pay the bank even more each year, like insurance, to make sure he is at the top of the list of people getting paid off if this ever happens. He gets a special arrangement, where even if they do declare bankruptcy, he still gets paid. And this is just the story of the first character. There are three main characters, or storylines. Four if you include Brad Pitt, and the guys working with him. The other two are Jared Vennett, (Ryan Gosling) and Mark Baum (Steve Carrell.) Vennett comes into the plot next, when one of those bankers mentions the whole thing to him about Burry coming in and what he was proposing. Vennett doesn’t just laugh at this idea the same way that everyone else does. Instead, he takes a closer look at it and realizes that Burry might actually be onto something. He sees the situation, but does not have the money or resources to do anything about it himself. And so he takes a meeting with Baum (Carrell,) and a team of his investors. Vennett uses a Jenga model to show what happens if some of the pieces that make up a package are weak. It’s all a little too simple of an example, as he starts pulling pieces out, and we all know that the more he pulls out, the more it will lead to the point where the whole thing falls down. The only thing interesting about this scene is the use of codes, written on each piece, such as double A or B. These codes stand for the typrs of mortgages that the banks are issuing. And then we have the story of the guys working for Ben Rickert (Brad Pitt.) These two other guys have a proposal for a financial plan and they are seeking investors. They go to meet with one potential investor and get turned down, but while there, in the building, they see the outline for another plan that another team proposed, left on the coffee table. This was the Vennett – Baum team’s plan, and now the two young men think they just found a secret tip. I love how the movie pauses here to explain that this is not exactly what happened and to tell us the way that it really did happen. With the package that these boys have snatched up, before leaving the building, they now go to Rickert to get him to back their new plan. If this sounds repetitive, that’s because it is. Christian Bale has an idea and needs a company to invest in it. 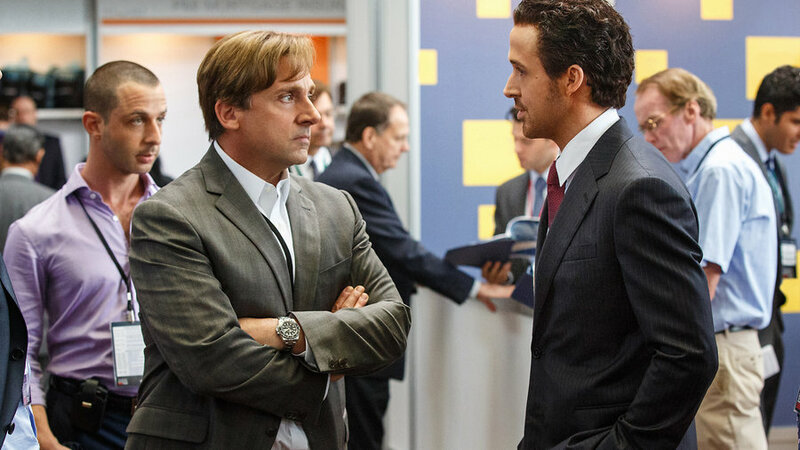 Ryan Gosling gets wind of his idea and takes it to Steve Carrell to invest in it. These two guys get wind of the idea and go to Brad Pitt to invest in it. This is the same thing over and over again, and you really start to feel that in the second half. There’s a great scene with Melissa Leo (her one and only scene in the film,) where she explains that the banks never turn down a mortgage appilcation and loan. And then there’s a bit where Baum and his guys go down to Florida to see that landlords aren’t paying off their mortgages, but they are still collecting rent from tenants. These deviations from the office scenes are helpful, but they’re not enough. Not when the movie is as long as it is. At two and a half hours, this movie really needed to be shorter. I would say that close to a full hour could have been trimmed off the film. When most of the plot lines are pretty similar, some of them could have definitely eben taken out. After all, the second half of the movie is basically just watching Burry write numbers up on a dry erase board each day, for how much the company has lost on his investment. And when it turns out that his investment is actually right, we don’t even get a scene of the people who doubted him coming to see him to tell him that they should have believed him, or to at least congratulate him. While there is a lot to be appreciated and commended about this movie, such as the humor and attempts to explain things to the viewer, it is still too complicated and definitely too long. For all of the conversations about money and whether or not this idea that has been proposed can actually happen, there aren’t nearly enough about the big picture. There are very few scenes or conversations where characters are villified, or where a moralistic approach or view on the whole situation is put in front of us. There is one where Baum calls out a head investor while he is speaking at a podium, and then another where Rickert speaks to his guys about why they shouldn’t be celebrating. Sure, it means a lot of money for them, but it also means a lot of heartache and misery for most of the country. This movie could have used more scenes like this. It was too long of a film, and too repetitive in its stoylines, and yet still, despite the lengthy running time, there were important elements that were totally missed.